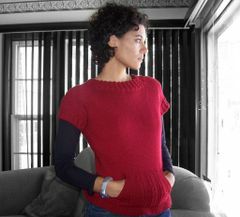 Here is the Telemark Baby Sweater that I steeked into a cardigan. I just told myself that I had to finish up the sleeves before I started another project. They didn't take that long as babe arms aren't very long or thick. Now, I just need to buy some toggles to hold it closed. I tried a million times to embroider something on the label with no success. I am putting embellishing onto the list with seams as something I don't do. While I would have loved for him to model it, the sizing is a bit on a large size right now. Just imagine how dashing he will look wearing this when the snow is flying! Now, onto my next project. What shall it be? I am thinking of a cardigan with short or cap sleeves perhaps... Any ideas out there? I hope you're getting a reprieve from hot weather there; ours is even a bit sunny these days. That's it! I'm off to my first day with students. I am so excited that I couldn't sleep last night. He will indeed be a dashing babe with that steeked sweater! I must say the color just makes me think of 6 feet of seed stitch for the FMS. Love the pics of the babe - too sweet! oh little munchkin! he will look dashing in his new blue sweater! So cute. I love the little baby gowns with elastic at the bottom. OK, I really, really, really want to hold him and hug him and kiss his soft, little head. Hope you visit before he gets too big to get kisses on the top of his head.